Long Beach, Calif. – Growing Roots, a full-service interiorplantscaping company specializing in design and maintenance of indoor plants for residential homes and commercial businesses, recently opened a retail store of the same name at 3940 4th Street in Long Beach. Owned and managed by Jennifer Perez, an interior plant professional servicing the Long Beach, South Bay and Orange County areas since 2002, the store offers a variety of indoor acclimated tropical plants, pottery, custom gifts and one-on-one consultations. 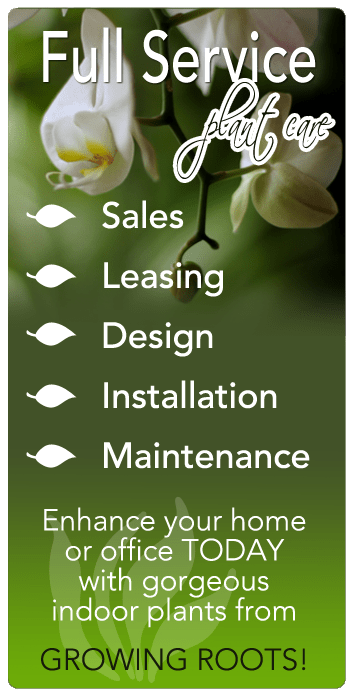 A supporter of the “Green Plants For Green Buildings” association, Perez also provides expert advice on the personal health and environmental benefits of indoor plants, and can offer plant advice for businesses working to meet Leadership in Energy and Environmental Design (LEED) certification. Growing Roots carries a wide range of indoor tropical plants, including dracaenas, bromeliads, aralias, orchids, succulents and various palms. About Growing Roots: Growing Roots provides the sales, leasing, design and maintenance of indoor foliage for the home, office or anything in between. Interior plants are obtained from nurseries and growers in the Los Angeles and Orange County areas, grown mostly in Hawaii, Florida and California and are appropriately acclimated to indoor lighting. www.growingroots.com.